The Android 1.6 platform introduces new features for users and developers. This page provides an overview of some new features and technologies. Android 1.6 includes a redesigned search framework that provides a quick, effective, and consistent way for users to search across multiple sources—such as browser bookmarks & history, contacts, and the web—directly from the home screen. The system constantly learns which search results are more relevant based on what is clicked. So popular contacts or apps that have previously been picked will bubble up to the top when a user types the first few letters of a relevant query. The search framework also provides developers a way to easily expose relevant content from their applications in Quick Search Box. An updated user interface provides an integrated camera, camcorder, and gallery experience. Users can quickly toggle between still and video capture modes. Additionally, the gallery enables users to select multiple photos for deletion. 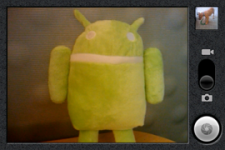 Android 1.6 also provides a much faster camera experience. Compared to the previous release, launching the camera is now 39% faster, and there is a 28% improvement in the time from completing one shot to the next. 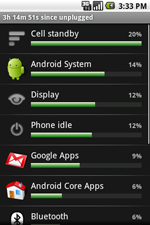 A new battery usage screen lets users see which apps and services are consuming battery power. If the user determines that a particular service or application is using too much power, they can take action to save the battery by adjusting settings, stopping the application, or uninstalling the application. Users will be able to download new accessibility services built on the new accessibility framework and enable them in Settings. For devices with Google Play, the latest version improves the overall user experience and makes it easier for users to discover great apps and games from developers. 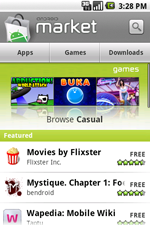 At the homescreen, users can choose among Apps, Games, and Downloads. Inside a category, users can explore titles that are Top paid, Top free, and Just in. For each title, users can now see screenshots submitted by developers in addition to reviews from other users. The Android search framework has been redesigned and expanded to provide third-party applications the opportunity to surface content from their applications in Quick Search Box, the global search tool. To do this, developers will need to make their app "searchable" and provide suggestions in response to user queries. To enable application search suggestions, users simply select each application from which they'd like to receive suggestions, under Searchable items in the Search settings. Android 1.6 features a multi-lingual speech synthesis engine called Pico. 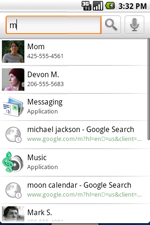 It allows any Android application to "speak" a string of text with an accent that matches the language. The engine supports the following languages: English (American and British accents), French, Italian, German and Spanish. If you're using a T-Mobile G1 or Dream device, you'll need to download the SpeechSynthesis Data Installer from Google Play, which includes the "voices" needed by the text-to-speech engine. A new gestures framework provides application developers with a framework for creating, storing, loading, and recognizing gestures and associating them with specific actions. Developers can use the new GestureBuilder tool included in the Android 1.6 SDK to generate libraries of gestures to include with their application. Android 1.6 provides a new accessibility framework. With this framework, developers can create accessibility plugins that respond to user input, such as making a sound when a new window is shown, vibrating when navigating to the top of a list, and providing spoken feedback. Android 1.6 adds screen support that enables applications to be rendered properly on different display resolutions and densities. Developers can also specify the types of screens supported by their application. Android 1.6 includes support for CDMA in the telephony stack. Android 1.6 upgrades the Linux kernel from 2.6.27 to 2.6.29. For a detailed overview of new APIs, see the Version Notes. For a complete report of all API changes, see the API Differences Report.